This excellent condition used tactical load bearing vest is combat mission ready vest for you to configure you gear in the most effective manner with MOLLE webbing on all sides. One size fits most as it is fully adjustible. SDS style #4117. This is sort of an exciting 'grab bag' because the used but excellent working condition vests will come with an assortment of MOLLE pouches attached and ready for use. 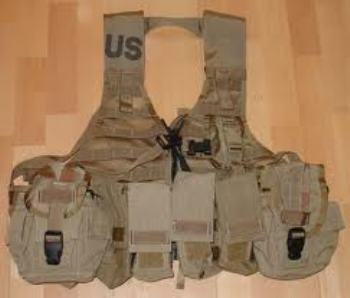 There will be at least Five pouches attached to the vest, usually a canteen pouch, M16 ammo pouch and some general purpose pouches, but each vest is different and are sold and delivered 'as is' for a great price of $50.00. See our store for a fantastic bargain on used vests with assorted pouches attached! SDS price = $86.29 with NO pouches our price for their great item + at least 5 pouches = $50.00! Note that the picture is a stock photo to show the vest and an idea of pouches attached, but each item for sale here is difference with a unique configuration of different types of pouches, do not expect your item to look just like the picture shown here. This item is a special product sold only in our internet business; contact us through our email if any questions.